SF Bay Area's High Cost Of Living Squeezes Restaurant Workers, Chefs And Owners The San Francisco Bay Area is known for its love of fine food. It's also increasingly becoming known as an area where it's almost impossible to live on a service-industry wage. Every morning at around 5 a.m., Armando Ibarra wakes up in the back of his van. He has been living there for the past couple of years. On his dashboard rests a holy candle. A rosary hangs from the rearview mirror. Ibarra walks over to his job at a chain hotel near San Francisco's airport. He says that at least he can wash up there. "I take a shower, drink my coffee, smoke a cigarette and ready to work." 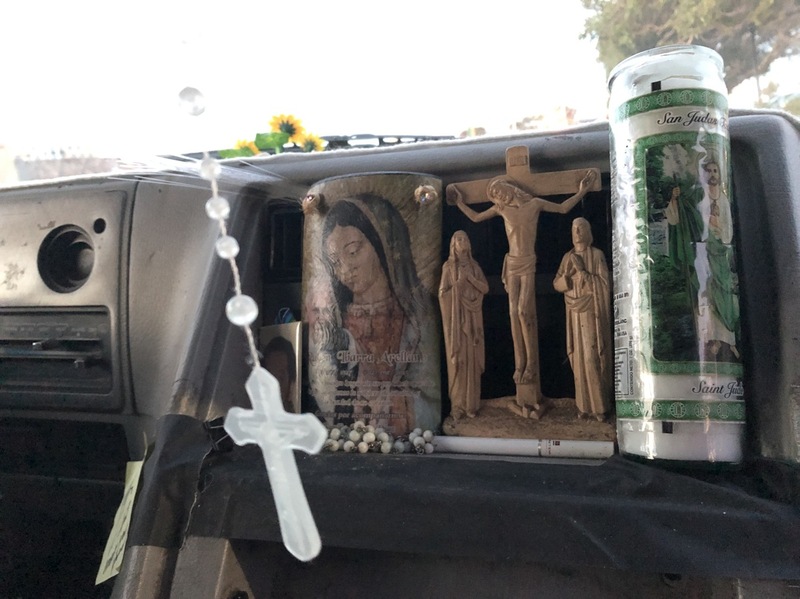 Armando Ibarra, a hotel restaurant worker in San Francisco, lives out of his van to save money — and to avoid an hours-long commute from San Jose, Calif. A holy candle rests on his dashboard; a rosary hangs from the rearview mirror. The hotel restaurant where Ibarra works as a food runner boasts creative, artisanal and healthy meals. People in the San Francisco Bay Area are known for being foodies (the city now has the most Michelin three-star restaurants in the U.S.). But behind kitchen doors, tension has been stewing for years: Service-industry workers like Ibarra say they can no longer afford to live in the Bay Area on their wages. And restaurant owners say the high cost of living has made it hard to retain staff and even to stay in business. The Bay Area is notoriously expensive. As the tech industry grows, rents have soared. A one-bedroom apartment costs well over $3,000 a month. The minimum wage just went up to $15 an hour, but the cost of living also keeps rising. Ibarra makes around $15 an hour. He used to commute from neighboring San Jose, one of the most expensive cities in the United States. He paid $800 a month for a room, but just slept there. When traffic was bad, the drive back from work could take as much as three hours. "You would go bumper-to-bumper, bumper-to-bumper sometimes. You get crazy," Ibarra says. He considered renting near work. But he couldn't afford it. He figured he was already spending as much as four hours a day in his vehicle, so he might as well just sleep there. The plight of low-wage workers like Ibarra is affecting the restaurant business. Just last year, several high-profile eateries shut down. One of them was Camino, known for its wood-fired cuisine. Co-owner Allison Hopelain says the restaurant took a major hit when its chef moved to Seattle because he couldn't afford to live in the Bay Area. "[He] felt like he would have better opportunities there in terms of opening his own place, buying a home," Hopelain says. She says things started unraveling when he left. Last year, after about a decade in business, Camino closed. Hopelain went on to open The Kebabery in Oakland. It's a small, cafeteria-style joint. You just pick your food and find a table. She says it's a much more affordable business model, but she also thinks it's what a lot of customers want. Decades ago, eating out was a special occasion, but these days Hopelain says people want to grab a quick, affordable bite of good food and head back to their lives. 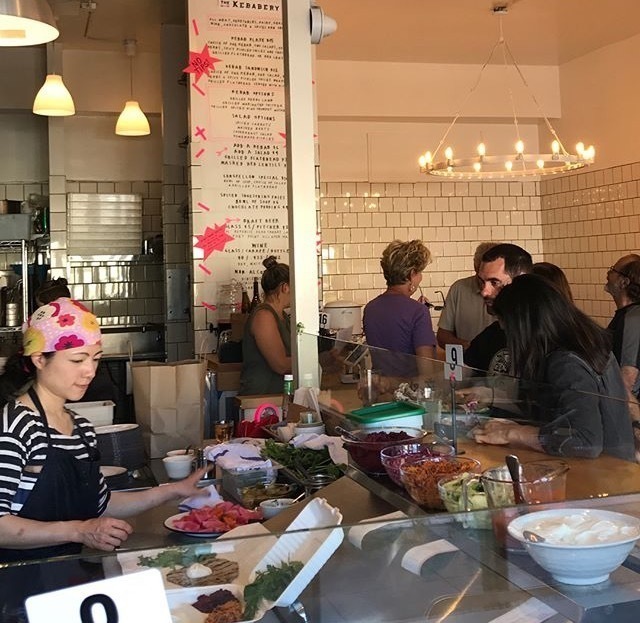 Allison Hopelain, owner of The Kebabery in Oakland, Calif., says the cafeteria-style restaurant reflects the changing tastes of customers who now want to grab a quick, affordable meal and head back to their lives. A few minutes north of Oakland, Peter Levitt says his restaurant, Saul's, with waiters, hosts and food runners, is part of a dying breed. "Your old diners with booths and breakfast and lunch table service — it's over," he says. 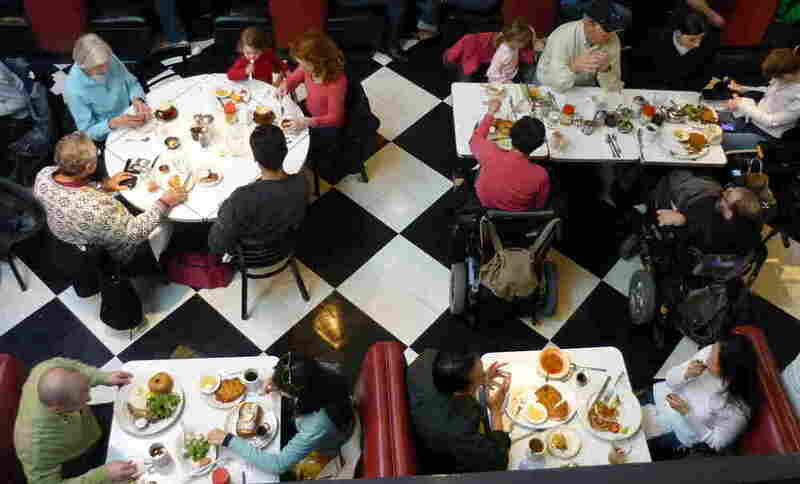 Saul's, a Jewish deli, is a landmark in Berkeley near the University of California campus. Professors and locals hold meetings in the cozy booths over bagels, blintzes, smoked fish and warm matzo ball soup. Peter Levitt, owner of Saul's, a Jewish deli in Berkeley, says that as the minimum wage and housing prices climb, "the menu prices have to go up, because you have to pay more to retain your labor force." Saul's was established in the 1980s, and Levitt has seen a change in the cost of living here unfold before his eyes. With workers getting pushed out of the Bay Area, he says, "we've seen our staff coming from further and further away." One of his cooks sleeps at his extended family's house nearby, on workdays, to shorten his commute. Levitt says Saul's might have to adapt to the changing times. "As minimum wages go up, and particularly as housing prices go up, the menu prices have to go up, because you have to pay more to retain your labor force," he says. "And at some point maybe there won't be enough clientele out there to pay the cost of table service to sustain this kind of restaurant." Some restaurants in the area are even turning to automation. Located in San Francisco's Financial District, Creator offers burgers created by local celebrity chefs. 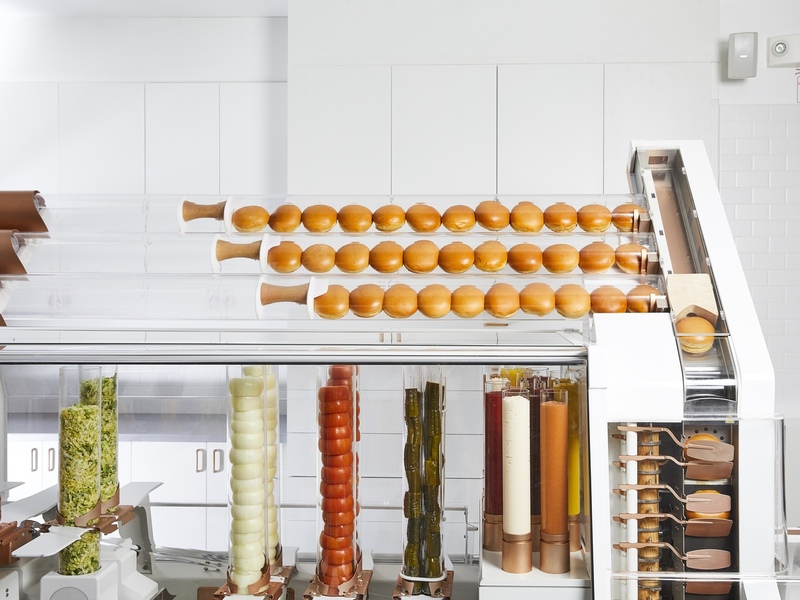 But the burgers are made by a giant robot that slices the brioche bun, grates the cheese and cuts the tomatoes. The end result: a $6 burger. The burger-making robot at Creator, an automated restaurant in San Francisco. Alex Vardakostas grew up flipping patties at his parents' restaurant, a burger joint in a little California surf town. He says the robot can flip burgers better, and more cheaply. "The only way you can make a burger of this kind of quality at that price is using a device that's going to grind meat to order. It's going to slice the tomato to order, slice the bun to order," Vardakostas says. Meanwhile, at the hotel restaurant where Ibarra works, a burger costs about $20. "You know, even when I get the discount, that's too much," he says. He says he usually just goes to Burger King or Taco Bell or stops by a gas station to eat before heading back to his van to sleep.